For the delicious light and natural sweetness of dried mangos, this snack item is for you! The complex flavor of mango is preserved and intensified in our Dried Mango. If you like our dehydrated mango slices, try our Dry Li Hing Mango, Wet Li Hing Mango, or our Dry Mango with Chili for a special tasty treat. 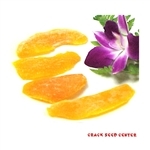 For other dried tropical fruits, try our Candied Pineapple and Candied Papaya Spears.